Obama and FDR: Why No Socialism in the United States? The responses to my blog on FDR and Obama prompts me to reconsider a question famously asked by the political theorist Louis Hartz in his classic work The Liberal Tradition in America: Why no socialism in the United States? Hartz’ much debated answer, greatly simplified here, is that because American political development skipped a feudal period, our political culture lacks any sense of class consciousness. Most of us consider ourselves to be the members of the broad, undefined middle class. 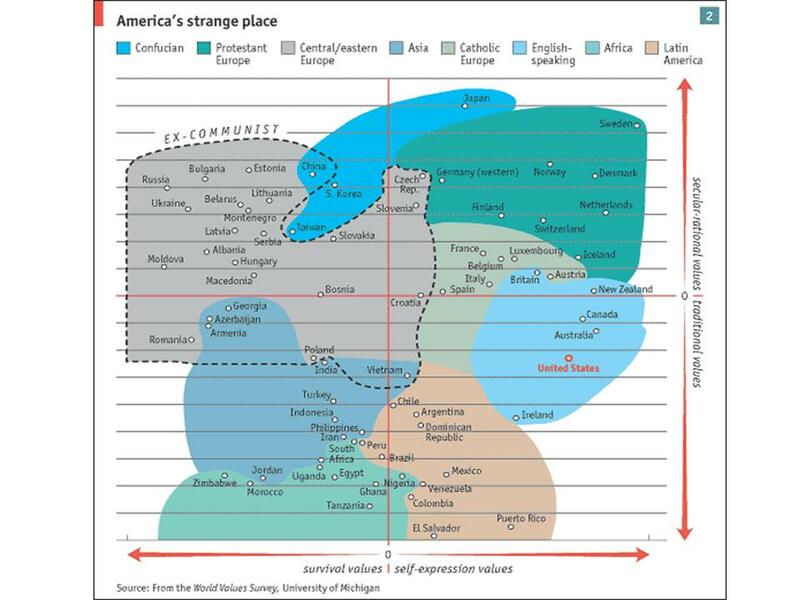 (As evidence of this, I always ask students in my introductory American politics course how many come from middle class backgrounds. Invariably every hand goes up.) As a result, our politics is dominated by an almost irrational commitment to Lockean liberalism, with its emphasis on individual rights and limited government. Hartz, like many political scientists, eventually went mad. But his question remains relevant today, as the response to my last blog suggests. Some of you will recall the fervent efforts by conservatives during the 2008 presidential campaign to unearth Obama’s “socialist” leanings (see here), and Obama’s equally fervent efforts to deny any ideological kinship with socialism. More recently, of course, critics of the proposal to rescue the banking industry by having the government buy up bank assets argue that it is a form of socialism – a charge proponents of the bank rescue plan deny. These exchanges are a reminder that, unlike in most of the world, socialism remains a dirty word in American politics. To explain the American aversion to socialism, political scientists usually point to two factors. One is the Hartzian notion that American’s commitment to liberalism – particularly individual rights – discourages the development of a strong central state. A second explanation, however, points to American political institutions, particularly federalism and the sharing of powers at the national level between two chambers of Congress and the president. American federalism, in which authority is shared concurrently between states and the national government, made the development of a strong working class party rooted in national labor unions more difficult because political parties developed and are organized primarily at the state level. This makes coordinating political action more difficult. So some states develop progressive parties, but others do not. And our system of shared powers, with a legislative body based on local representation, provides many points of access for intense minorities to intervene in the legislative process. In particular, this allows businesses with a vested economic interest in limited government to block efforts to pass legislation increasing the size of the social welfare state. Think back to the effort by small business and insurance companies to block health care reform during the Clinton presidency. More broadly, this American aversion to socialism makes us an exception in the world. Consider the following two charts. 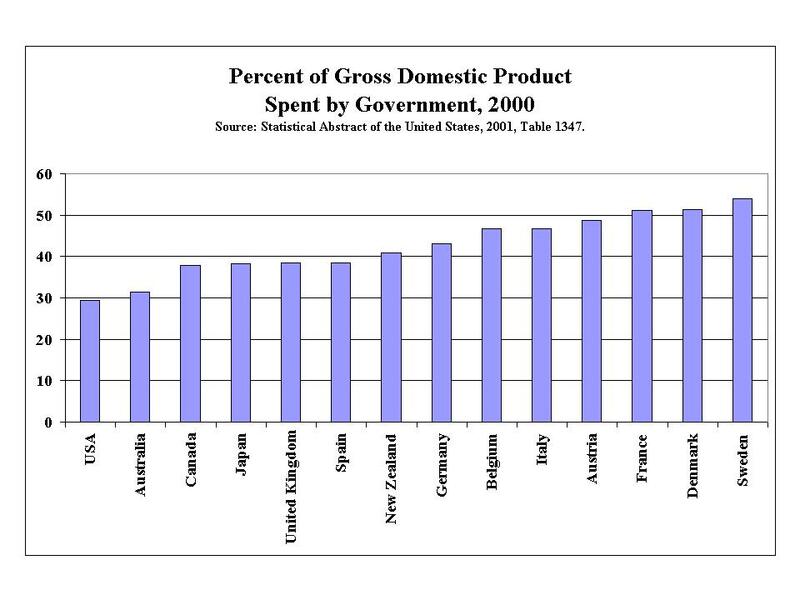 First, note that as a proportion of GDP, we spend much less than many nations on government programs. 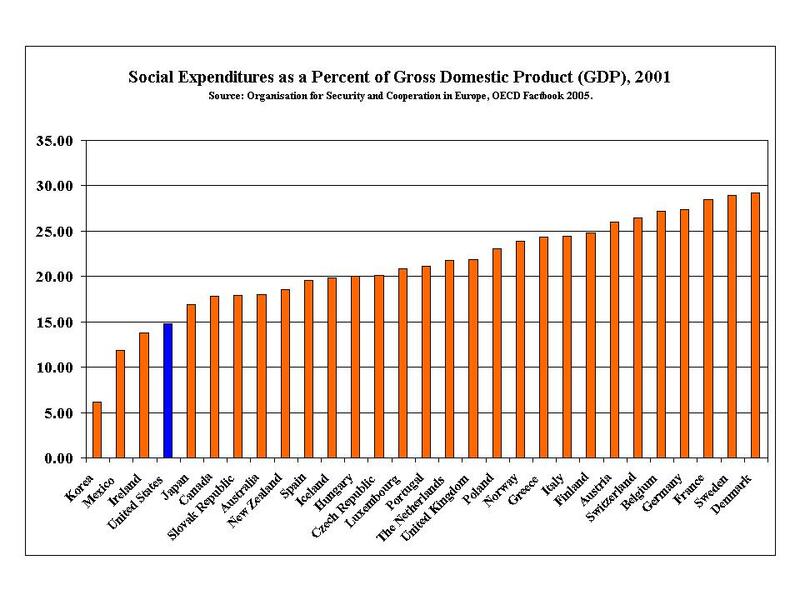 And we spend much less on social welfare programs. All this is a long prelude to the issue raised by Liz in her response to my discussion of the Obama/FDR comparison. She suggests that Obama might yet be an FDR-like “transformative” president if he is able to persuade Congress to pass social welfare policies that are now common in many industrialized nations. I confess that, given the dire economic circumstances facing the country now, the focus of my critique of the FDR/Obama comparison was on the creation of jobs and the revitalization of the American economy. But perhaps my focus is misplaced. Perhaps, as Liz suggests, Obama may yet push the Democratic Congress to expand the social welfare state through the adoption of policies such as paid parental leave, a government-run, single-payer health care system, nationalized banking system and other statist policies. If so, he might yet go down in history as one of the greater presidents. In a later post I will give my thoughts on Liz’ suggestion, but I am curious to hear from you first. What do you think? Will Obama, working through the Democratically-controlled Congress, succeed in expanding the social welfare state? And, if so, will he be the next FDR? Is Obama the Next FDR? Let’s Hope Not! Is Obama the next FDR? Among the several presidents Obama is supposed to be channeling, FDR has become the favorite historical archetype for many of his supporters. It is easy to understand why. Roosevelt is typically rated among the three greatest presidents, and that ranking is based at least in part on his handling of the Great Depression. For his part, Obama has more than once argued that we are facing the worst economic crisis since the Great Depression. It is natural, then, that some would want to compare the two presidents in terms of the magnitude of the crisis they faced. “Student” raises an excellent question: did FDR’s “bold persistent experimentation” bring the U.S. out of the Great Depression or did it actually extend the economic crisis? One of the benefits of the Obama-FDR comparison is that it has reacquainted the average American with the long-simmering debate between historians, economists and political scientists regarding just how effective FDR’s New Deal policies were in ending the economic crisis. That debate has reemerged in the context of the Obama stimulus package, leading to some heated debate (see here and here, for example) Obviously, I am not going to settle that debate in this blog. But let’s take a look at three broad gauges of economic health during FDR’s time in office: unemployment, per capita income and growth in GDP. What do the numbers show? So, at first glance, it appears that the economy improved, albeit unevenly, during the first two terms of FDR’s presidency but never really made it back to the pre-Depression levels until World War II, when the transition to a wartime economy finally ended the Great Depression. But these figures cannot tell us whether FDR’s programs are responsible for ending the crisis, or at least moderating it, or prolonging it. Note that the fault line in this debate isn’t necessarily between liberal and conservative economists, with liberals arguing that FDR ended the Depression and conservatives saying he did not. In fact, many liberals argue that FDR was slow to appreciate the benefits of deficit spending, and as late as 1937 made the mistake of trying to balance the budget, thus precipitating another mini-depression. These are the same arguments that many liberal economists, like Paul Krugman, are making today regarding the Obama stimulus package: that it is too small to stimulate a lasting economic recovery. Other economists, like Milton Friedman, argue that Roosevelt’s New Deal had little impact on the Great Depression because, at root, it was caused by a too-tight monetary policy under control of the Federal Reserve combined with excessive tariffs that led to a slowdown in trade. From the monetarists’ perspective, what ended the Depression was not deficit spending. Instead, it was the easy money policies that fueled economic expansion during World War II and an opening of trade barriers. I’ll leave it to you to delve into the finer points of this debate, such as whether to count government “makework” jobs in the unemployment figures or not. I want to make a different point: if I’m Obama, FDR is not the president that I want to be using for a historical reference. In fact, the less I mention FDR and the Great Depression, the better off I am. Why? For two reasons. First, Roosevelt’s stature as one of the nation’s three greatest presidents is not because he is credited with getting us out of the Depression. As you can see, there’s no agreement that he did so. But there is agreement that his New Deal forever changed Americans’ expectations regarding whether government should provide a social welfare safety net to cushion the inevitable economic downturns associated with the business cycle. The lasting New Deal legacy is not primarily the “make-work” programs run by the Works Progress Administration or the infrastructure created in terms of bridges and public buildings by the Public Works Agency. Instead, these programs are noteworthy because they signaled that the federal government was now responsible for ameliorating the impact of economic depression. This was a huge change in public expectations, despite the uncertainty regarding its efficacy in ending unemployment. FDR’s greatness, then, is in establishing the expectation that the federal government will protect the poor and the elderly by establishing a social safety net. Consider the following New Deal legislation. The creation of Social Security in 1935 effectively ended widespread and persistent poverty among the elderly and is now considered sacrosanct, immune to political tinkering. That legislation also established a series of federal grants to the states for additional old-age assistance, aid to the blind, and aid to dependent children. It was under FDR that the government first took on broad responsibility for handing out checks to the unemployed, a function previously left entirely to states or not at all. Other New Deal legislation include the Wagner Act that established collective bargaining rights for unions, and the 1938 fair labor legislation that established federal minimum wage standards. And there is a host of New Deal regulatory policy that I could cite as well. So we see that FDR’s stature as one of our great presidents rests on two pillars: his war leadership, but also in changing public expectations regarding government’s responsibility for the social welfare of those who cannot help themselves. If FDR didn’t end the Great Depression (and the debate rages on), his presidency certainly initiated a sea change in our expectations for what government should do to lessen the impact of that crisis on ordinary Americans. And that’s why I think Obama would do well to downplay any talk about the stimulus bill and FDR’s efforts to end the Great Depression. For starters, the economic crisis is no where near what FDR faced. Remember, unemployment is hovering at about 7-8% now. Roosevelt took office when 25% of the workforce was unemployed. After two terms in office the rate was still 14.6%! If we see a reprise of those numbers, Obama won’t have to worry about comparisons with FDR – he’ll be a one-term president and Republicans will control Congress for the foreseeable future. By talking as if we are facing a reprise of the Great Depression, moreover, Obama isn’t doing much to bolster consumer confidence in an economic recovery. Nor is Obama going to change our expectations regarding the need for the national government to protect the social welfare net. That expectation is ingrained in our public consciousness, thanks to FDR. By citing FDR’s response to the Great Depression, Obama creates unrealistic expectations that he is somehow going to match FDR’s response in terms of the New Deal’s impact on the public psyche. But the situation is not analogous, and it’s hard to see how Obama can have an equally transformative effect. If I’m Obama, nothing good comes from channeling FDR. It merely resurrects the debate regarding the efficacy of FDR’s efforts to end the Great Depression – the same debate that divides Republicans and Democrats today, and which “student” raised in the comments s/he sent in. And it provides an unrealistic and unnecessarily pessimistic (so far!) picture of the economic situation today. If anything, the modern president who entered office facing similar economic conditions to today is Ronald Reagan. In combating the stagflation of the Carter years, Reagan combined a perpetual sunny optimism with a strong dose of bipartisanship policymaking, the latter necessitated in part by Democratic control of the House. Of course, Obama won’t share Reagan’s ideology. But he might draw some useful lessons in putting together a bipartisan coalition. (I’ll talk more about this in a later post.) If Obama is going to look for instructive historical comparisons from which to draw governing lessons, then, he’d do better to look at Reagan, or as I’ve suggested in a previous post, at Clinton. Even George W. Bush offers more useful lessons, especially in foreign affairs, than does FDR. Is Obama the next FDR? For his sake, and ours, let’s hope not.